There exist those weird moments in life when pictures of the past, flash upon you and brutally drag you to younger ages! A split-hair second becomes a time-machine, triggered by a smell, a reminiscent glimpse, a familiar face of a stranger. A typically indifferent moment, instead of passing by to its road to oblivion, decides to stay and play with you, your memories or your long-forgotten thoughts. Memories that lay hidden at the deepest corners of the brain, expose themselves and pose all sorts of difficult questions… Not personally to you! But rather to the kid that you always hide: When did I last meet this now-lost friend? What were my last words to him? Did I know back then, at this typical afternoon “goodbye”, that I would never see him again? Where is the toy that I cherished as a child? When I last placed it in the toy-drawer tens of years ago, did I know it would be forever? Why am I not missing all these? What has changed? Relations and emotional links torn apart, not by a firm decision, a powerful choice or a necessity, but rather by the strongest element of nature: Time. The long and winding road to the bottom of oblivion… And then! This tinker second… This powerful glimpse… This intrusive force that brings your lost childish thought or deeply buried picture back to the surface! I was literally spending my last minutes in Nafplio town, the former capital of Greece. We were to depart in less than an hour. It was probably the eighth visit to this picturesque place, but this time I had my camera with me. Magnificent scenes shoved over to my face, mercilessly. Beauty unleashed without any need to seek it. Nafplio photos easily captured but void of any feeling of success that comes after working hard for them. Scouting the place, chasing the light and being the first to conquer a magic moment is probably the thrust behind any photo venture. But without them? A feeling of “I have been here too…”. It’s like searching for a secret passage, only to find that it exists but it’s now a touristic highway with signs pointing to it everywhere. A thought that re-surfaced. My bicycle that I had as a kid, standing against a wall. Or should I say still waiting for me… When did I last ride it? When did I last greet it? What roads did I last cross with it! Was I playing the good or the bad guy? Only this bike, serving to remind me what I had long forgotten. And then these steps ahead, moving upwards. As if I had left my bicycle here in oblivion, to ascend life, exiting the childhood picture at the first alley. A place now empty cause I had to grow up. I had to grow up. And I had to change scene. Not that I decided it… But you see, it’s always this vicious element: Time. This otherwise “indifferent” second in time, decided to play with me, bringing past moments and thinking that it would bury again to the deep sea of subconscious. But I had my camera with me! And since it wanted to play with me, I wanted too! It was my spontaneous decision to hold this memory alive. A shameless decision to keep all these unasked questions at the foreground. Even if I could still not answer them! 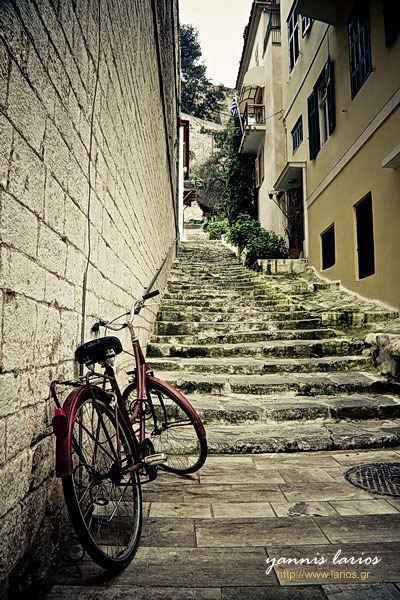 I composed the scene to include the bicycle and the stairs ahead. I shot two photos of my childhood that later de-colored during photo-processing. I do remember capturing this place. I am not sure about the time though. Was it afternoon? What was the day? And the year? One thing was sure… I had embarked on an unbalanced fight. I was challenged by this playful “second in time” and, on my part, I was determined to not let it go. Can I please keep my bike or my youth reminiscence, vivid? I am not sure! This entry was posted in photography, photos, Stories behind photos, Yannis Larios | Greek Travel and Wedding Photographer and tagged bicycle, childhood, Nafplio, time, Yannis Larios photography. Bookmark the permalink. Thanks so much for visiting and commenting on my photo blog! I really appreciate the advice and tips! You have some great photos and I hope to learn much from your work!